As a Christian, I always enjoy this time of year. Perhaps, “enjoy” is the wrong word, especially for two thirds of the Triduum, as people of the Christian faith will understand, but I find it spiritually uplifting, far more than Christmas. There is good reason for this: Easter is by far the most important time in the Church’s ecclesiastical calendar as it commemorates then celebrates what Christianity really is: following Christ, the Son of God and God made Incarnate, who loved us so much He died for us in the most horrific manner possible. I do not say this to shock and scare; as my parish priest said on Good Friday, it is the fact we are human and therefore suffer that we can look to the Cross for comfort from God. As God, through his only Son, knows exactly what it is like to suffer as a human being, be it through the daily stresses and strains of life or through illness and sickness. And as Father Hugh said on Friday, when no ones cares about you, turn to God as He always cares and loves us, shown to us through Jesus Christ, his only Son, hanging on the Cross, the centre of the Christian faith. Categories: Uncategorized | Tags: Christianity, Easter | Permalink. Respect for Islam but not Christianity? Yet again a puerile, infantile “artist” has decided to commit atrocious blasphemy by depicting himself as Jesus Christ in his new music video. 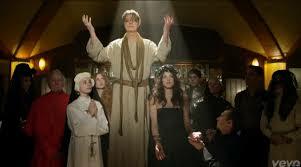 David Bowie wears robes striking a Christ-like pose promoting his song The Next Day whilst his fellow performer, Gary Oldman, appears dressed as a priest dancing with a prostitute in a brothel. One such prostitute in the music video is played by Oscar-winning actress Marion Cotillard who, dressed in underwear, is seen kneeling staring upwards as blood pours from the palm of her hands in a deliberate portrayal of stigmata – a term used by Christians when body marks appear on people corresponding to the crucifixion wounds of Jesus Christ. During the production of the video, did David Bowie contemplate using Islamic imagery instead perhaps? The question is, of course, rhetorical. Christianity is seen as an easy touch for entertainers who wish to be “controversial” to sell records. Madonna (a cradle Catholic no less) has been overtly blasphemous for years in her performances as was Michael Jackson at times, despite being allegedly a Jehovah’s Witness. Politicians on both sides of the Atlantic have tolerated this and even promoted it with their fear of offending Islam but quite happily attacking Christianity, as was seen by David Cameron deploying his Government lawyers to the European Court of Human Rights earlier this year to defend the UK Courts decision that British Airways had not acted discriminately against their employee when they banned her from wearing a cross at work. They, fortunately, lost and the ECHR ruled Nadia Eweida had suffered discrimination at work. I can’t quite see British Government lawyers acting in the same way in a case of discrimination if a Sikh had been banned from wearing his turban or a Muslim lady had been banned from wearing the Hijab. Government lawyers fighting Christians in the Courts and along with comments from Prime Minister David Cameron saying his Christian faith “is a bit like the reception for Magic FM in the Chilterns: it sort of comes and goes”, this all adds up to a culture of treating Christianity as a lesser religion than Islam or Judaism by the British political establishment. And the upshot is our cultural performers feel they can cause maximum offence against what is still the biggest religion in Britain. 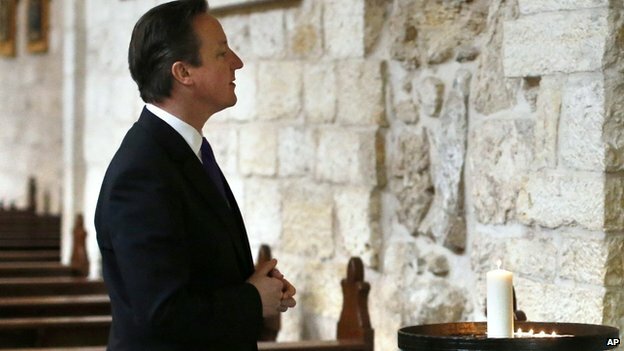 Categories: Politics, Religion | Tags: Christianity, David Bowie, David Cameron, ECHR, Gary Oldman, Marion Cotillard | Permalink. As this is published, I will be attending the Easter Vigil service at St Mary’s Parish Church on Woodbridge Road, Ipswich, to celebrate the joy of Easter. And it is a joy – far more than Christmas and the inhuman commercialisation, which manages to cloud the birth of Christ for even practising Christians like me. But Easter is different. It is the most important time in the ecclesiastical calendar when we celebrate the Paschal Triduum, which is the period of three days recalling the Passion, death, burial, and resurrection of Jesus Christ. It starts on Holy Thursday (also called Maundy Thursday) when we celebrate the Mass of the Lord’s Supper, which also includes the priest washing the feet of some members of the congregation to celebrate how Jesus washed the feet of his disciples at the Last Supper as a sign of His humility. Then on Friday, as we did yesterday, Mass is not celebrated (the only day in the entire ecclesiastical calendar it is not) but there is a celebration of the Lord’s Passion and the Adoration of the Cross, commemorating the crucifixion of Jesus Christ. It takes place at three o’clock, the time it is considered Jesus died on the cross. During the service, the Passion is read aloud, which is the account of Jesus’ arrest in the Garden of Gethsemane, his trial in front of Pilate and his handing over to the Jews for crucifixion. The Veneration of the Cross and Holy Communion (consecrated on Holy Thursday) then takes place. With respect for the Death of Christ, the service is ended with no hymn but instead the congregation leave in silence. Then the final part of the Paschal Triduum starts this Saturday evening with The Easter Vigil (the first day of Easter is on Sunday, which concludes the Triduum). This is the most important Mass of the liturgical year and is the first celebration of the Resurrection of Christ this Eastertide. The service begins in darkness and therefore the celebration must begin after sunset. 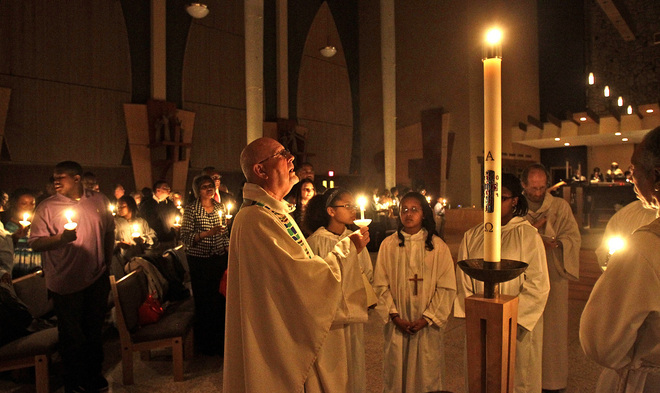 The blessed Paschal Candle (there is a new one every year) is lit from the blessed Easter Fire by the priest and from this Paschal Candle hundreds of other candles are lit, individually held by worshippers in the congregation. This ritual is called The Service of Light and signifies Jesus bringing light and eternal life into the world through his Resurrection from Death. The Paschal Candle is carried through the church to the Sanctuary and once placed in its stand, the lights are switched on. The Liturgy of the Word consisting of seven readings from the Old Testament are then read. After these readings conclude, the candles are lit on the altar and the Gloria in Excelsis Deo is sung for the first time since before Lent and the church bells, silent since Holy Thursday, are rung again. It is this point Christ is Risen. After the priest’s Homily, the Baptismal Liturgy begins, where the congregation renew their baptismal vows. It is at this time new members of the Church are baptised and/or confirmed to enter into full communion with the Church. This year, five Catechumens from St Mary’s Parish will be welcomed into the Church, which will add another dimension to the service. The Liturgy of the Eucharist will then follow, for the first time since Holy Thursday. 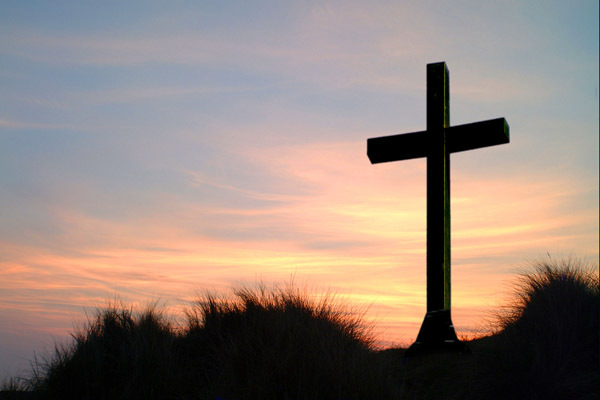 After 40 days of Lent, the joy and renewal of Easter bursts into light throughout the World. Easter is celebrated for 50 days and ends on Pentecost Sunday. May you enjoy the wonder of Easter! Categories: Religon | Tags: Christianity, Easter, Jesus Christ | Permalink.